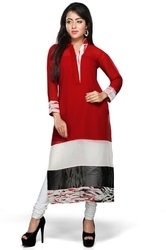 We offer Designer Cotton Kurtis are a very good choice for any occasion. Fine fabric is used to manufacture designer Kurtis/Tunics. Delicate and intricate designs in designer kurtis adds an elegant and special touch to the outfit.This kurtis glorifies look of the wearer. Due to their latest designs, attractive patterns and beautiful colors, these tunics can be worn at both casual and party occasions. The sophisticated warehousing are necessary for longterm storage and safe delivery to the clients. We offer varied payment mechanism and shipments to reduce cost of final good. We are offering Indo Western Kurti Tunic, Ladies Tunic Kurti, Ladies Designer Tunic and Ladies Indo Western Top Kurti. Our team of expert designers have manufactured these designer tunic using best quality fabrics, threads and allied material. Due to their latest designs, attractive patterns and beautiful colors, these tunics can be worn at both casual and party occasions. Designer Georgette Kurti Innovation is our forte and we strive to design and develop an alluring assortment of optimum quality. These kurtis are manufactured by our designers in complete compliance with the latest trends and styles. 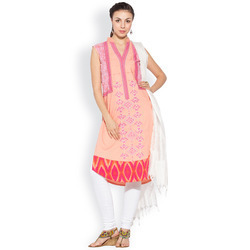 Offered kurtis are very comfortable to wear and easy to clean. Fancy Kurti We are able to supply all branded Pasistani suits in both stitched and un-stitched form. We can custom make your size in exactly the design and pattern shown in the picture or as per your specific requirement . Vibrant black kameez styled with white printed motifs on the center and pink and black printed patterns on the right side panel. The black sleeves have dot designed patch border. White churidaar and black and white shaded dupatta complete the look. We are a trusted name of the industry engaged in offering a comprehensive range of excellent quality Indo Western Designer Tunics. Under this range, we are offering Indo Western Kurti Tunic, Ladies Tunic Kurti, Ladies Designer Tunic and Ladies Indo Western Top Kurti. Designer Kurti that have been fabricated from a fine grade of linen. Procured from some of the authentic and trust worthy mills, these fabrics are stored in pest and rodent resistant Ware housing facilities at our Sophisticated infrastructure. The sophisticated warehousing are necessary for longterm storage and safe delivery to the clients. We offer varied payment mechanism and shipments to reduce cost of final good....Due to their latest designs, attractive patterns and beautiful colors, these tunics can be worn at both casual and party occasions. Beautiful designer Kurti tunic top party wear Designer Cotton Kurtis. Our Kurtas are available in exclusive designs and are applicable for casual or formal wear. We presents these Tunics in various designs and color combinations. These Tunics can be worn on any occasion ranging from casual wear to formals and party collections. Ladies Designer party wear Long Kurta tunic Designer Short Kurta, which is available with us in various sizes, designs, colors and patterns. The offered range of designer kurta is manufactured using pure cotton fabric, These Ladies Tunics are made from high quality of raw material which ensure durability at its user end.We offer wide variety of Designer Party wear Tunic,Indian Traditional Tunic,Casual Tunic. Ladies Trendy Georgette Kurti party wear We hold years of experience in offering a qualitative range of Designer Short Kurta, which is available with us in various sizes, designs, colors and patterns. These kurtas are manufactured by our experienced fashion designers in accordance with the current fashion trends. This elegant & classy tunic is highly appreciated by clients for its unique embroidery and neat stitching. Owing to our years of experience and in-depth knowledge of this domain, we are offering a qualitative range of Ladies Long Tunic Kurti to the esteemed clients. We manufacture the offered range of kurtis using premium quality fabrics and threads that are procured from the reliable vendors of the market. These tunics are highly appreciated among the clients for their attractive designs, neat stitching and detect-free embroidery work.